When traveling is important not forget anything and especially put your money in a place that is the more safe as possible. There is a multitude of wallets for traveling. The important thing is to feel ourselves comfortable. A few years ago, I went to Barcelona and bought like this,to avoid bolder hands on the famous stree Las ramblas. Nowadays, I have a wallet like this one. Wallet that was offered by a very special person. Here I put the passport (if i go outside the European Union), the 'boarding pass', documents / tickets to museums / shows that have been purchased in advance. I also have always the craze to take some extra money in other place, like on the cabin bag for example. To prevent a non working credit card or stealing. 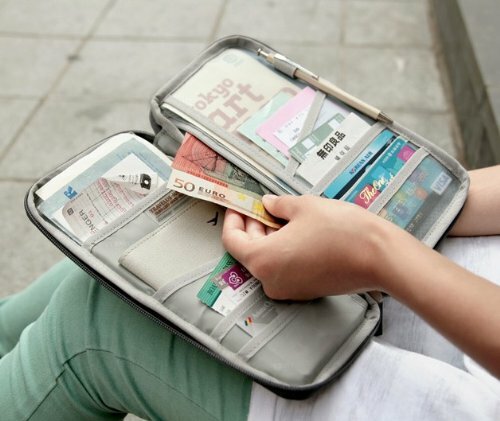 For more travel wallets see here !